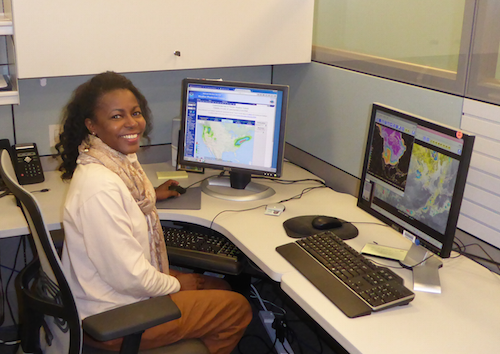 Arlene Laing at her desk at the NOAA/National Weather Service Weather Prediction Center. Image courtesy of Arlene Laing. Arlene Laing first became interested in meteorology at age nine when she received a book about the weather as a prize in school. A few years later, her geography teacher showed her some weather instruments and a book of weather maps. She started recording daily weather in a journal. At age 13, she decided she definitely wanted to have a career in meteorology. 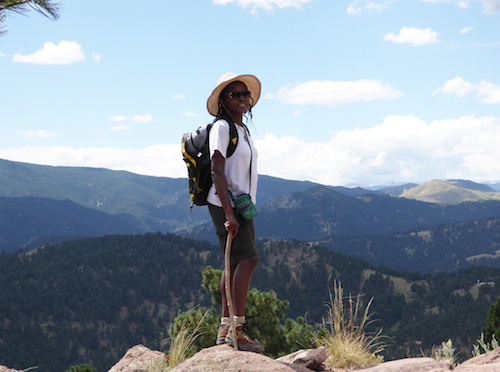 Laing now works for the Cooperative Institute for Research in Environmental Science (CIRES), a partnership between the National Oceanic and Atmospheric Administration (NOAA) and the University of Colorado-Boulder. There, she’s a research associate. She works on projects in the NOAA Weather Prediction Center Hydrometeorology Testbed. She turns research results into forecasting tools. For instance, when scientists studying rainfall find certain patterns in pressure or humidity before a big storm, Laing tests whether those patterns produce rainfall over and over again. She uses the same computer models that weather forecasters use. This way, she can see if the models match what happens in real life. In the end, this could lead to new forecasting tools. Laing helps develop these new tools and shows forecasters how to use them. How did she get this job? In high school, Arlene Laing focused on math, physics, and chemistry—subjects she likes a great deal. She earned a bachelor’s degree from the University of the West Indies, where she majored in meteorology and minored in computer science. After that, she went to graduate school. She earned a master’s degree and doctoral degree in meteorology from Pennsylvania State University. In graduate school, she did research on high impact weather systems that produce much of the heavy rain and severe weather throughout the world. Later in her career, she taught university students, did research with weather forecasters, and trained forecasters. This gave her the experience and knowledge she needed to get a job at NOAA. 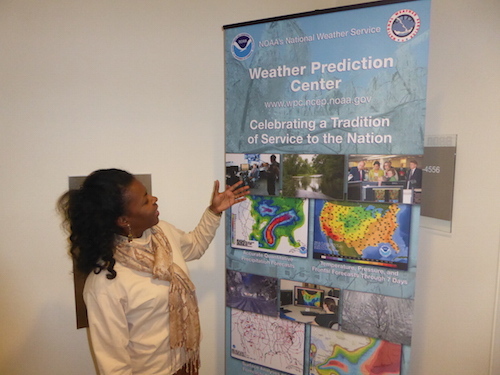 Arlene Laing at the NOAA Weather Prediction Center. Image courtesy of Arlene Laing. Most mornings, Laing attends a 30-minute weather discussion presented by Weather Prediction Center forecasters. In these discussions, she sees how they create their forecasts and the challenges they face in their work. For the rest of the day, she’s on her computer working with computer programs to do research that will, in the end, help weather forecasters. Arlene Laing enjoys hiking, dancing, skiing, snorkeling, and reading. Image courtesy of Arlene Laing. Arlene Laing uses information from GOES satellites. This helps her do research on lots of different weather phenomena, including large thunderstorm systems, jet streams, and clouds. GOES satellites also help with education and training. 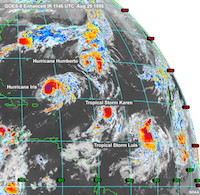 She uses satellites images of weather systems like hurricanes to educate people about weather.